Counting and number recognition activities for preschool, pre-k, kindergarten, nursery, childcare, SPED, early intervention, and home school classrooms. The activities can be used with one child, small groups, or large groups and are easily differentiated. 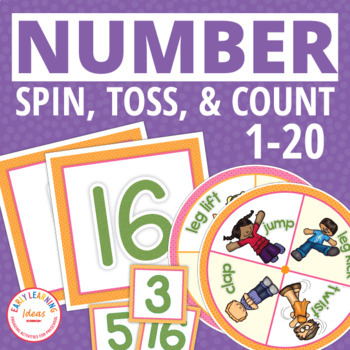 They provide a great way to work on number or numeral recognition and reinforce the concepts counting and cardinality in an active, engaging way. ****PLEASE NOTE that this product is also included in my NUMBERS SUPER BUNDLE. You do not need to purchase this product if you have already purchased the super bundle. See the preview file to view sample pages of the product. Small number circles can be attached to bottle caps or counting chips. Place them in a bag or container. 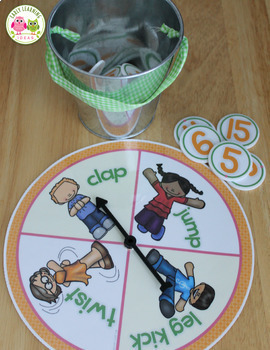 Children can spin the action spinner, select a number from the bag, and perform the action the resulting number of times. 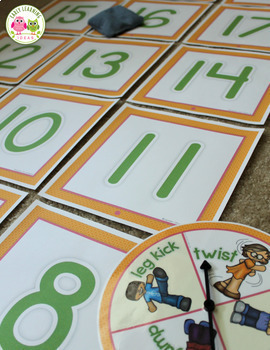 The large number signs can be laminated and placed on the floor in front of children. 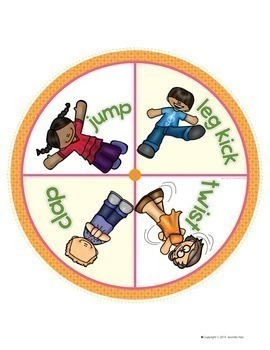 Children can toss a beanbag to select a number, and spin the action spinner to select an action. Children will be thrilled to get their wiggles out while they learn. The number signs and circles can be used for matching games as well. Click here to see additional math and ten frame activities. Click here to see additional counting activities. Click here to see my newest products.